Welcome to the Paw Paw's Campers and Cars website and to the fun filled world of RV living. Whether you're seasoned in the recreational vehicle lifestyle or just beginning, we can help you get the RV or Camper that's perfect for you. We sell new and used recreational vehicles by the hundreds and can save you thousands of dollars on the RV of your choice. If you are interested in a Class-A gas or diesel motorhome, a Class-C motorhome, a travel trailer, a fifth-wheel, a Class-B van, a park model...whatever, we've got you covered! Search our Inventory for a new or previously owned RV. 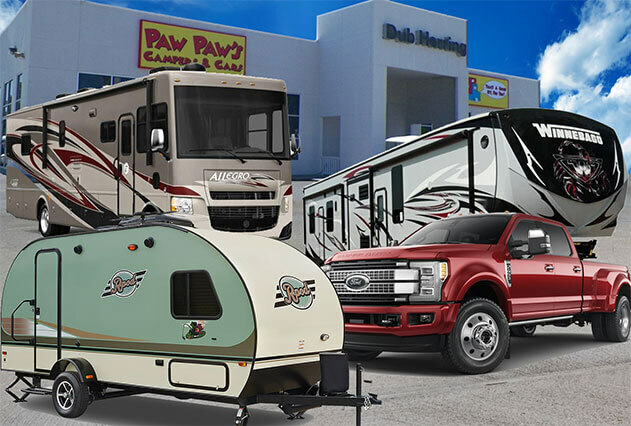 Paw Paw's Campers and Cars is the gulf-south's highest volume RV dealership. We cover the entire Gulf-Coast from our Picayune, Mississippi location. We are the leading area dealer for new recreational vehicles manufactured by Tiffin, Coachmen, Keystone, Cross Roads, Winnebago and Forest River. Our inventory includes some of the most recognizable brand names in the RV world. We carry models like: Allegro, Allegro Bay, Allegro Bus, Phaeton, Lexington, Freelander, Catalina, Freedom Express, Galleria, Rockwood, Zinger, Redwood, Rushmore, ReZerve, Wildwood, Sunseeker and many more. Paw Paw's Campers and Cars is growing everyday so if you don't see the new model that you're looking for listed, call us anyway, we may have it today. Or, if you're in the market for a used recreational vehicle, please visit our pre-owned RV inventory to get a glimpse of the numerous makes and models available to you. However, if you don't see what your looking for check back soon because we trade for used RV's everyday and update our website regularly. Or, you can call or E-mail us with your specific request. We are here to help you attain your dream. Got a used car, truck, or RV that you want to trade in for a new or pre-owned car, truck or RV? Paw Paw's Campers and Cars can help! We make it possible for you to trade your car, truck or RV in toward the purchase of a used car, truck or recreational vehicle. Drive in and drive away in the vehicle of your choice. WE TRADE! We'll even consider trading for other valuable items like real estate, boats, planes, and more. Just contact us. We're positive we can help you out. We're also positive that we can do what it takes to earn your business. YES!! Paw Paw's offers 0% down. YES!! Paw Paw's offers 90 days to first payment. YES!! Paw Paw's offers cash back. YES!! Paw Paw's liberal lenders offer the lowest rates. Need help selling your used recreational vehicle? Paw Paw's can help there too. Let us take your RV and sell it on consignment. We'll get you a check...fast! If it's service you need, we offer service with a smile! Paw Paw's professionally trained technicians and service staff provide prompt courteous service on all makes and models of recreational vehicles including full chassis work. If it's broke, we'll fix it! Visit our Service Department. They say that "parts is parts" but not at Paw Paw's Campers and Cars. When you need a special part for your motorhome, travel trailer or fifth-wheel call on Paw Paw's first and we'll get the right part for you in a jiffy, 'cause parts is not just parts'. The many manufacturers that we represent survey our customers for customer sales and service satisfaction and the surveys say... that Paw Paw's Campers and Cars is #1 in customer service. Friendly and courteous sales and service is very important to us at Paw Paw's because we know it is to you. Visit our Parts Department. We are located in Picayune, Mississippi, at 808 Memorial Blvd., which is less than an hours drive from New Orleans and Baton Rouge, Louisiana and from the Cajun country of south Louisiana. When you're in town for Mardi Gras, The New Orleans Jazz and Heritage Festival or to take advantage of the bountiful area hunting and fishing remember to come see us. We'll make it easy for you to drive home in a new recreational vehicle. Hey, here's an idea: Drive or fly into any one of the many area holiday destinations, have fun, then drive home happy in your new recreational vehicle from Paw Paw's. Take a vacation and still save money. It could be that easy!!! The exciting world of RV travel makes for a great fun filled family outing. Whether it is tail-gating with friends and family at college football games, traveling across country to attend your favorite NASCAR event or just getting back to nature, Paw Paw's Campers and Cars has got you covered! "That's a Good Camper, Paw Paw!"